Brookfield Multiplex will construct its upcoming landmark central business district residential apartment project, Eq. Tower. Brookfield will add to its extensive portfolio of 877 projects to date with the construction of what is set to be a 63 level residential tower with extensive amenities and natural elements in mind. The approximate $169 million dollar construction contract has already surpassed expectations, having sold the bulk of apartments in less than 12 weeks on the market. Elenberg Fraser, the Eq. Tower, set to adorn A’Beckett Street, focuses on promoting a community lifestyle, hosting a vast collection of luxury amenities including a 25 meter outdoor swimming pool and BBQ area, indoor gym, sauna, spa, private dining rooms, karaoke suites, cinema, games room and lounges. Property Observer that the tower would be a strong sense of community and integrated vertical living. “Elenberg Fraser has succeeded in bringing this vision to life and so we present Eq. 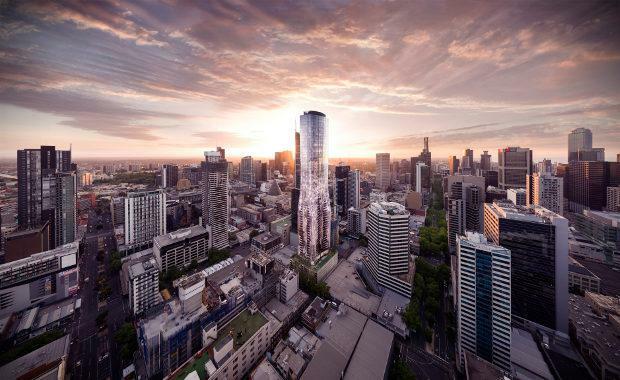 Tower as the future of Melbourne living where residents can enjoy just as many experiences within their own apartment building as outside of it” Mr Mai said. Innovatively designed with natural elements in mind, the tower will feature a green curved glass curtain façade, designed using parametric equations that determine weather patterns and sunlight, to ensure that all living spaces receive optimum natural lighting. The tower also boasts the use of rainwater harvesting and reuse as well as photovoltaic solar panels, water efficient fixtures and appliances and high performance double-glazing throughout the structure. ICD are confident with their decision on partnering with Brookfield, with Mr Mai telling media “Eq. Tower is a complex project in terms of its scope of amenity, its intricate curved façade and the innovative techniques used to design the building. With this in mind we knew we wanted to partner with Brookfield Multiplex due to their long-standing reputation for delivering world-class, complex projects”. The tower is set to offer café and shopping facilities on its lower levels, transforming A’Beckett Street into a landmark of its own accord. Eq. Tower is expected to be completed by June 2017.